The Sea Tel 100 TVHD is also capable of receiving worldwide Ku-Band High Definition and Standard Definition programming without having to make adjustments to the hardware. 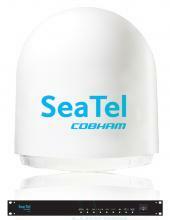 • Receives (2) Ka-Band and (1) Ku-Band DIRECTV® satellites simultaneously. Enjoy DIRECTV® HD programming atthe dock, on anchor, or underway.